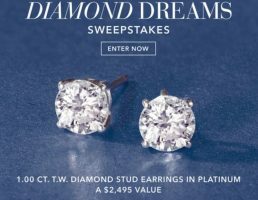 You could win a pair of 1.00 ct. t.w. Diamond Stud Earrings in Platinum. This Sweepstakes is open only to legal residents residing in the 50 United States and D.C., who are at least the age of majority in their state of residence and who had Internet access prior to the start of this Sweepstakes. The Sweepstakes is entered only on the Internet. Individuals who have access to the World Wide Web on the Internet and are the authorized users of an Internet email address may enter during the Sweepstakes Period. Complete the entry form found by going to www.ross-simons.com/sweeps on the Internet or by completing a pop-up box that will appear from time to time on www.ross-simons.com during the Sweepstakes Period. You will receive one (1) entry. Prize, Approximate Retail Value (ARV) and Odds: (1) Grand Prize – A pair of 1.00 ct. t.w. Diamond Stud Earrings in Platinum. ARV: $1,695.